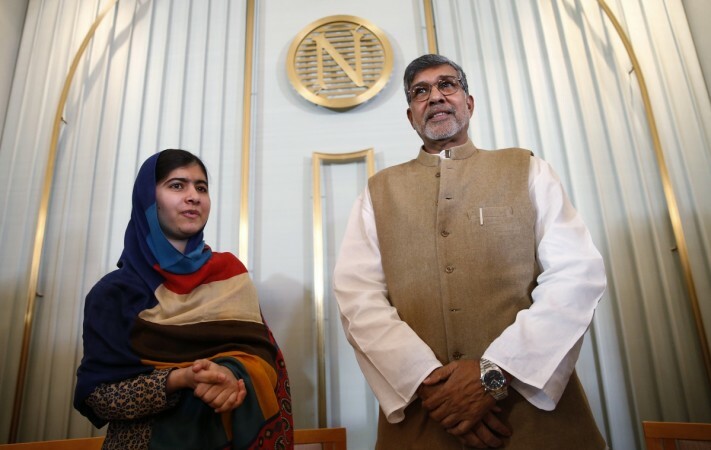 Indian Nobel Prize laureate Kailash Satyarthi and Pakistan's Malala Yousafzai on Tuesday stressed on the importance of trust and friendship as the key elements to sustain peace in South Asia. The two urged the leaders of their respective countries to embrace peace. "Trust and friendship is important for sustainable peace between India and Pakistan," Satyarthi told reporters in Oslo on the eve of 2014 Nobel Award Ceremony. "For me, relationship between people of India and Pakistan is more important than the talks between the two Prime Ministers," said the 60-year-old, who shares this year's Nobel Peace Prize with 17-year-old Malala. Satyarthi said that he will try to find in India, Pakistan and other countries, a way for the youth and children to walk together on the path of peace, reports ibnlive.com. "Because, peace is not something which can be negotiated on the tables and made sustainable, neither it is something which can be taught in temples and mosques. Peace is every child's human and fundamental right," he said. "Our youth should also realise that with respect, with freedom, with good education and with peace we want to live our lives. And if there comes any obstacle in this path, the youth from India and Pakistan will strengthen the fight for peace under the leadership of our daughters like Malala," added Satyarthi. Malala on her part said that that India and Pakistan needed to embrace peace. "If we teach the children about tolerance, patience and peace, then by God's grace there will be good relations between India and Pakistan and we will be like brothers once again," she said, adding that the relations between India and Pakistan will improve only when the children of the two countries are educated. The teenage child rights activist said that it was her wish that Pakistan Prime Minister Nawaz Sharif and his Indian counterpart Narendra Modi attend the award ceremony. "It is my wish they stand together (here) and talk about peace. It would have been a great thing," Malala said. India and Pakistan have not been on the best of terms recently because of cross-border firing and cancellation of the Foreign Secretary-level meeting in August by New Delhi.